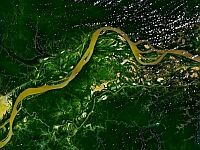 The Amazon River and rainforest viewed from space. Nov 6 (IPS) – Plants are the only source of oxygen on Earth — the only source. Studies around the world show that as plant species become extinct, natural habitats can lose up to half of their living plant biomass. An ecosystem is like a soccer team needing both star athletes and supporting players that act as defence and make passes to be successful. Highly productive and important “star” species in an ecosystem, such as trees, need many unique and complementary “supporting” species for the forest to remain healthy, he said. Currently, one species goes extinct every three hours. And the rate is accelerating. The PNAS study summarised the results of 44 experiments from around the world that simulated plant species extinction and showed that ecosystems with fewer species produce up to 50 percent less plant biomass than those with more “natural” levels of diversity. “Our analyses provide the most comprehensive evidence yet that natural habitats with a greater variety of plant species are more productive,” said co-author Michel Loreau of McGill University in Montreal. The importance of biodiversity is not well appreciated by policy-makers or the public, says Ahmed Djoghlaf, executive secretary of the Convention on Biological Diversity (CBD). “They are unaware of the consequences nor the urgency of the biodiversity crisis,” Djoghlaf told IPS last September. Many people have lost their connection to nature and think there are infinite resources. That relationship has to change, he said. And that change could be upon us since environmental issues have never been more at the forefront of people’s minds. “It is crucial to seize the moment to engage people in the preservation of species that are the foundation of life on Earth,” Djoghlaf said. For full story please click How Many Species Are “Enough”?